The main attraction near Tower Junction in the northeast of Yellowstone National Park is Tower Fall, viewed from a short footpath starting at a busy roadside parking area that often fills up on summer days. 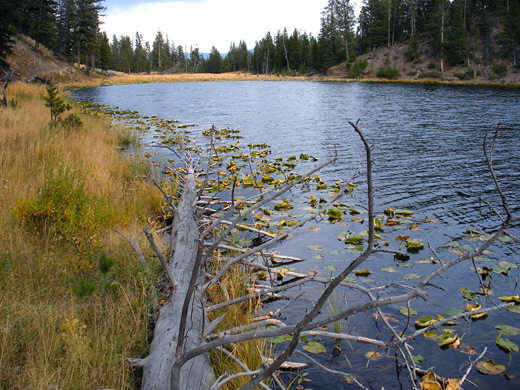 Much quieter and more peaceful are several trails on the opposite (southwest) side of the road at the edge of Blacktail Deer Plateau; the principal destination is Lost Lake, a narrow, scenic pond lined with lily pads and bordered by high forested hills to one side. Wildflowers grow profusely along the grassy banks in early summer and the lake is a good place to see wildlife especially beaver, moose, black bears and various types of birds. 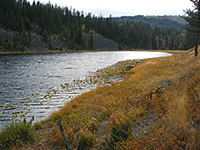 The location can be reached from two trailheads each requiring a hike of less than a mile, or visited as part of a 4 mile loop. The western Lost Lake trailhead is at the end of a short paved side road to the petrified tree, forking off the highway 1.5 miles before Tower Junction. 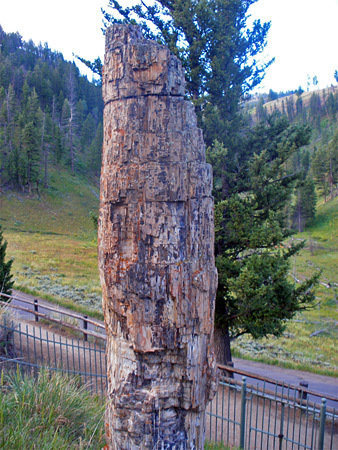 The tree is a vertical fossilized redwood trunk about ten feet high, enclosed by a fence to protect it from vandalism - two similar trees nearby were removed piecemeal by early park visitors, though stumps can still be seen. 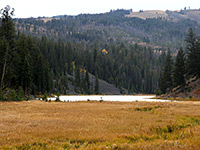 From the parking area, a level trail heads southeastwards along the floor of a shallow treeless valley, reaching the end of Lost Lake after 0.7 miles. A second path runs due east over partly wooded land then down a slope to the alternative trailhead, located behind the log cabins of Roosevelt Lodge. If starting from here, non-residents need to leave vehicles at a pull-out along the main road rather than at the lodge itself. The trail to Lost Lake from the lodge is a little more challenging than the western route since it climbs 300 feet up a steep hillside, but also better since gaps in the trees allow distant views over Pleasant Valley to the north, and the path passes close to 40 foot Lost Creek Falls - a short spur leads up a narrow ravine to the base of this secluded waterfall, which is quite forceful in spring but a mere trickle in late summer. The main trail zig zags up the steep slopes through tall, widely separated Douglas fir trees, reaches the edge of the plateau after half a mile, then joins another path from Tower Fall campground. 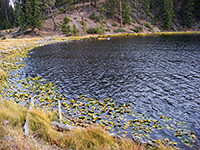 Lost Lake appears after a short (0.2 mile) walk across marshy meadowland; the path continues right along the north shore and on towards to the western trailhead.